Do people keep asking, what is the perfect budget for an electric toothbrush? If you have a similar query on electric toothbrushes, this article is for you. I have put in extensive research into this – to conclude that a $100 bill is just about enough. Yeah, it has to be the best electric toothbrush under $100. Most of us do not feel much use for the cheaper alternatives and the latest flagship models are often too expensive. 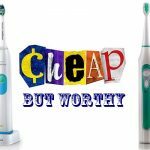 If you throw a casual glance at toothbrushes below $50, you will see that most of them lack the important features that you should expect from them. On the flip side, if you feel like adding a couple of extra features, you could have to add another $50 to the $100 bill; even when these features are easily avoidable. 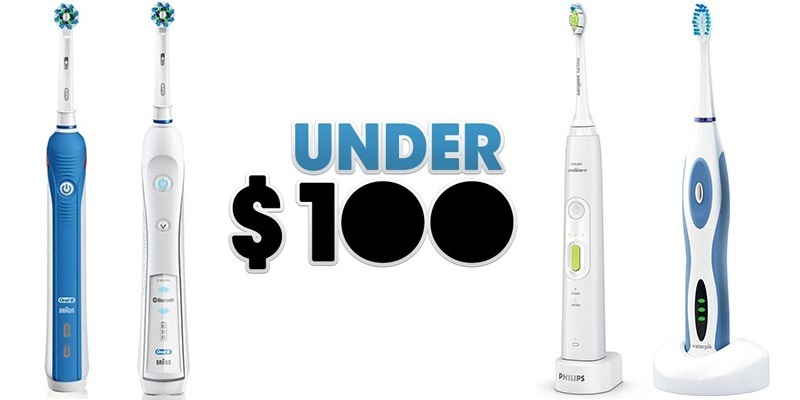 So what is exactly on offer when you choose an electric toothbrush below $100? For one, you get them for a very decent price. The features they offer are the ones that are really necessary – like gum care mode, pressure sensor, deep clean and 2-minute timers. 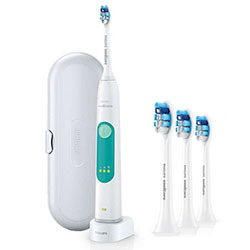 Electric toothbrushes under $100 also do a great job at removing plaque along the gum line and from between the teeth. Much of the appreciation for this range goes to the manufacturers who thought deeply about the need of customers. A number of electric toothbrushes under $100 have invaded the market latterly. It is naturally difficult to grab the best. 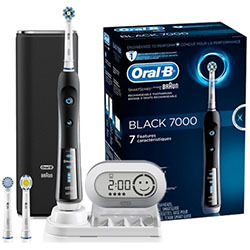 Just hang in for another few moments and I will send you through to some of the best electric toothbrushes under $100. Additional insight is on me! The Pro 5000 Series comes with Bluetooth powered by Braun and packs in a frenzy of features. And this is not the typical mad frenzy. You can actually make use of each of the features as you go. Like the Bluetooth feedback allows you to monitor brushing habits in real time, taking the personalization straight up by a few notches. The floss action of the head gives you superior hold on cleaning between teeth and along the gumline.The 3D cleaning action of the Pro 5000 SmartSeries stands out. It executes distinct motions of oscillation, rotation and pulsation. This allows it to disintegrate the plaque, especially along your gumline. The pressure sensor is present on the brush and you receive notifications both on the brush and the smartphone when brushing becomes too hard.There are five different modes on the brush: whitening, deep clean, sensitive, gum care and daily clean. 5 cleaning modes with individualistic functions. Pressure sensor for both brush and smartphone. Mobile feature is not really necessary. Typical Oral-B charge problem six months into use. 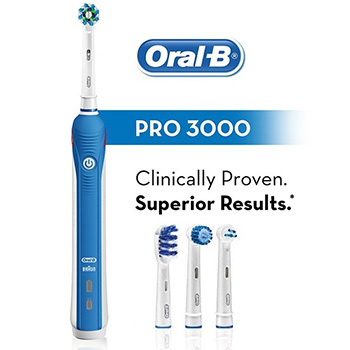 Not many electric toothbrushes will promise you whiter teeth in just a day.The Pro 3000 from Oral-B does just that. We put their promise to test. And let’s just say they are slightly over confident here.While your teeth look fresh, visible whiteness is just another few miles away. 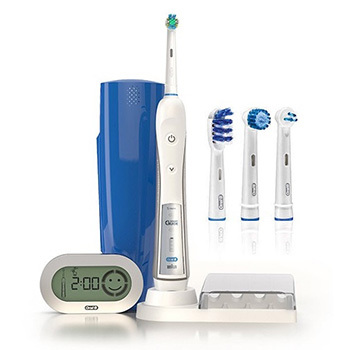 But that does not come at the cost of features.There is Bluetooth powered app-connectivity that allows you to personalize the entire brushing experience in very little time.There is a brushing timer placed strategically on the handle.It pulses once every 30 seconds. 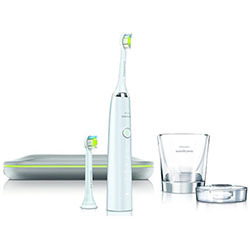 This lets you know when you have to switch over to the next area in the mouth.You can make good use of the three modes in the toothbrush: the Clean plus comes with a pressure sensor which tells you when the pressure is too hard.The gum care mode gently massages the gums.If you have tooth-sensitivity issues, you can choose the sensitive mode. Incorporation of 3 distinct modes. Sensitive mode for gentle cleaning. 30-second timers for area switch. Noisier than other Oral-B models. Fails the one-day whiter challenge. 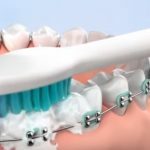 There’s nothing like it when you can have two products for the price of one.The Plaque Control Plus of the Sonicare range throws that at you, and then revs up with impressive features. 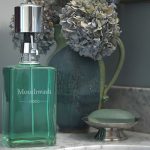 They have cut the slack on the modes and you get just one mode on the two toothbrushes – the one that works. The real extra is the additional brush diamond clean heads that come with the package.With the diamond clean heads, you can expect the brushes to remove up to 7x more plaque like in the more expensive Diamond Clean modes by the company. And you may safely skip all those unnecessary speed settings which are rarely functional and even more rarely effective.So if you are looking to save your money by buying a product that really works for you, this is the one you will ever need.The Plaque Control Plus really cleans teeth and it is pretty neat about that function. Two extra diamond clean brush heads. 7x more plaque removal with included heads. Just one easy mode for effective brushing. Noisy operation persists for many months. Lacks the power of other Sonicare. For of those of you still using a manual toothbrush, the Healthy White Plus from Sonicare comes a natural progression into electric toothbrushes.The Healthy White Plus has the capability to remove up to 100% more stains than manual toothbrushes. The brush comes with a patented Sonic technology, which generates up to 31, 000 brush strokes every minute.You will be particularly impressed with the dynamic fluid action that helps inject fluid deep between the teeth and also along the gumline. The Healthy White Plus Sonicare works equally well with plaque as well. 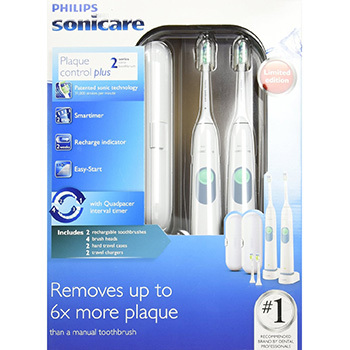 It has the capability to remove up to seven times the plaque that is managed by a manual toothbrush. The clean and white mode of the brush has a proven capability in the removal of stains. But you will not make much of it if you have lesser stains on your teeth anyway. There are three settings in intensity. It is just that you will need only one once you are settled with it. 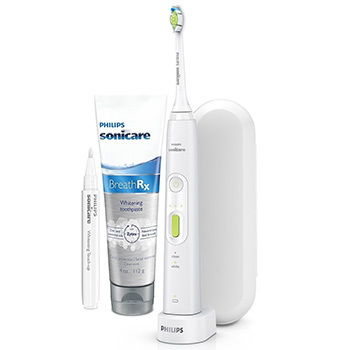 Check out more information about Philips Sonicare Healthy White Plus. Drives fluid deep between teeth and gumline. 100% more stain removal, 7x more plaque removal. 3 speed settings for added convenience. Replacement head better than original. Only one bonus head in pack, misleading description. The Complete Care Water Flosser from Waterpik is a genuine combination of brushing and flossing.You will like it if you wish to terminate the need for additional flossing altogether. 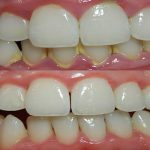 The company claims to provide healthier gums in just 14 days.The combination of pulsations and water pressure helps deep-cleaning between teeth and also below the gum line. 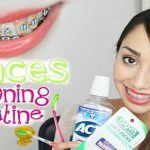 Now, these are the problem areas where regular flossing does not generally give you much return. A premium hard-sided travel case comes included with the Complete Care Water Flosser. 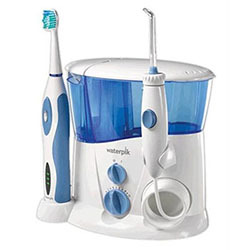 If you are someone who does not want to compromise on dental health even when travelling, Complete Care from Waterpik is a worthwhile option. There are two classic tips, an orthodontic tip and a pik pocket tip that work in combination to remove the last spec of plaque from teeth. There is a standard brush head that you can use for all-round cleaning of teeth. Cleaning and flossing action in one device. Healthier gums in two weeks. 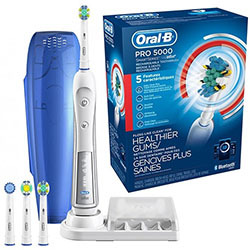 What makes the Oral-B Pro 5000 SmartSeries Power Rechargeable Electric Toothbrush a better choice than the rest? There is really no choice when you have something as good as the 5000 SmartSeries from Oral-B. For just about $20 more than the nearest competitor, you get a full boatload of features. The five cleaning modes aren’t there just for the sake of being there. The pressure timer is serious business. The floss action round head takes care of the gumline as well. But the real deal is the way you can personalize daily brushing with real-time app feedback and Bluetooth connectivity. That one feature really brings the bacon home for the 5000 SmartSeries. Finding a good electric toothbrush is a quest next to none. Back up your comfort needs with what you really hope to find in the market.